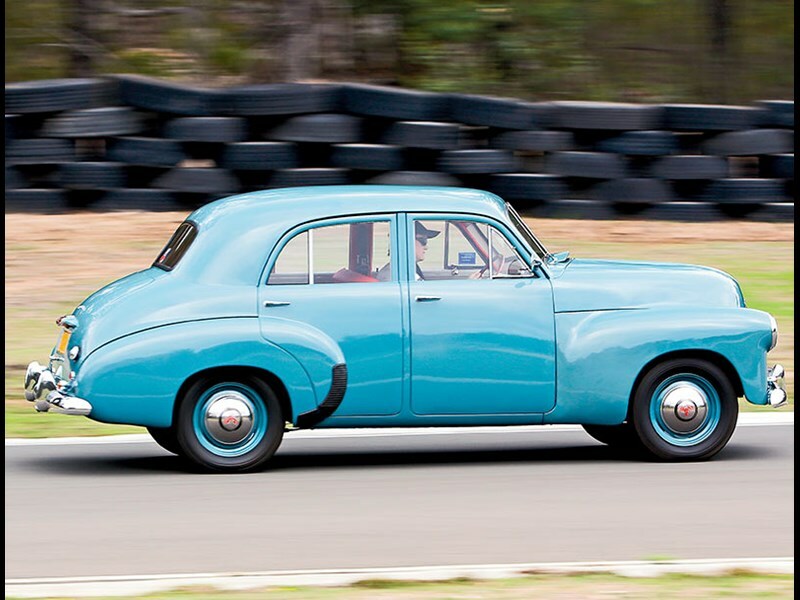 As the Australian car manufacturing industry grinds to a sorry halt over the next couple of years, it seems a little ironic that we should be celebrating the car that really started the whole local manufacturing thing, the 48-215, or FX Holden as it’s better known. 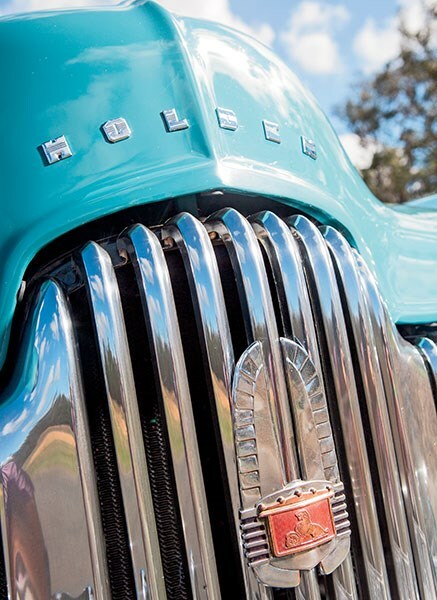 Until 1948, plenty of cars were being assembled in Australia – Ford had been assembling Model Ts at Geelong since 1925, for instance – but it wasn’t until the Chifley government got excited about local manufacturing straight after World War II that things really began to happen. General Motors eventually took the government’s bait and agreed to set up shop in Australia. Once the manufacturing plant had been established at Port Melbourne, the wheels were set in motion and FXs began burping off the production line. The official unveiling took place at the Oriental Hotel in Melbourne on 26 November 1948. 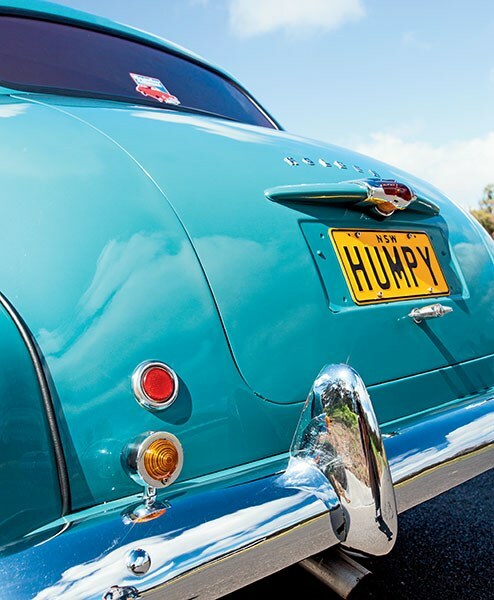 If the car looks a lot like a scaled-down American Chevrolet, there’s a very good reason: The original design was intended to be a Chevrolet, but it was deemed too small for post-war America, so the design was handed over to the Aussies. Several prototypes were tested in the US and then shipped here. They were a regular sight around the Dandenong Ranges, where Holden’s test drivers hammered them over a durability test most days of the week with a couple of Chevs in attendance for comparison. According to one Holden old-timer I spoke with, the test crews wore out three Chevs for every one Holden. That durability was a huge part of the FX’s success. Not only did it have excellent dust sealing, which was important when you consider how many Australian roads were unsealed at the time (the Nullarbor Plain wasn’t fully sealed until 1976), the FX was also light on its feet. Literally. In fact, it weighed just on a tonne and, with simple but effective suspension, it could handle the corrugations and bulldust of this wide brown land without falling off the perch (as early Falcons did). The old grey motor put out about 60 horsepower (45kW) and, while that doesn’t sound much, against that small weighbridge ticket and gearing that gave about 20mph for every thousand revs, the 48-215 was a pretty good performer for the day. In fact, there really wasn’t much that could stay with an FX from the lights and you could argue that the Aussie love of torquey, relaxed performance was born with the FX. Beyond performance, though, the FX was pretty sparse. There were no indicators, heater or demister, and a single tail-light. Some would call that GM cost-cutting, but it was also to save weight, as was the fitment of a six-volt battery. A good FX is getting hard to find now, but if you do get to drive one, you’ll be amazed by the smoothness and near-silence of the grey motor and the tiny turning circle (just on ten metres). It can feel a bit tippy-toe at times, but the body roll is countered by the FX’s ability to skip over rough patches rather than dive into them. Compared with a Pommy Standard Eight of the time with a one-litre sidevalve engine, the six-cylinder, OHV FX must have been an absolute revelation. 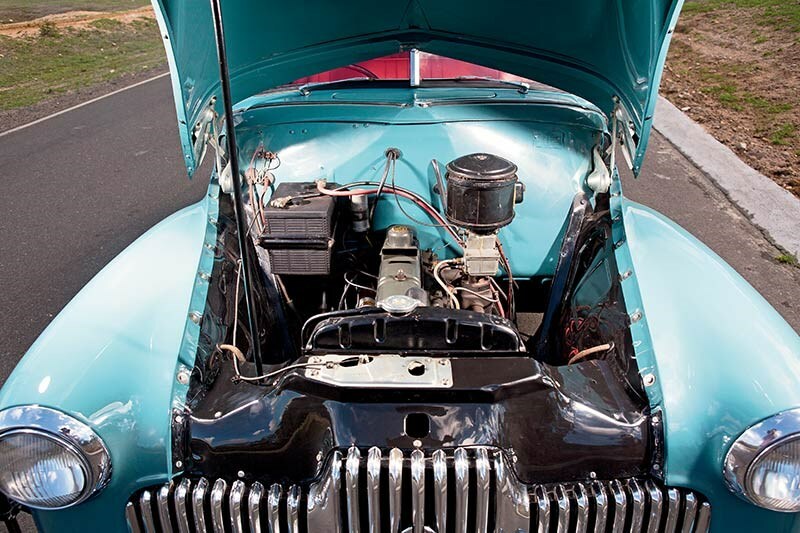 The original 48-215 was the first high-performance Holden in the context of its time. 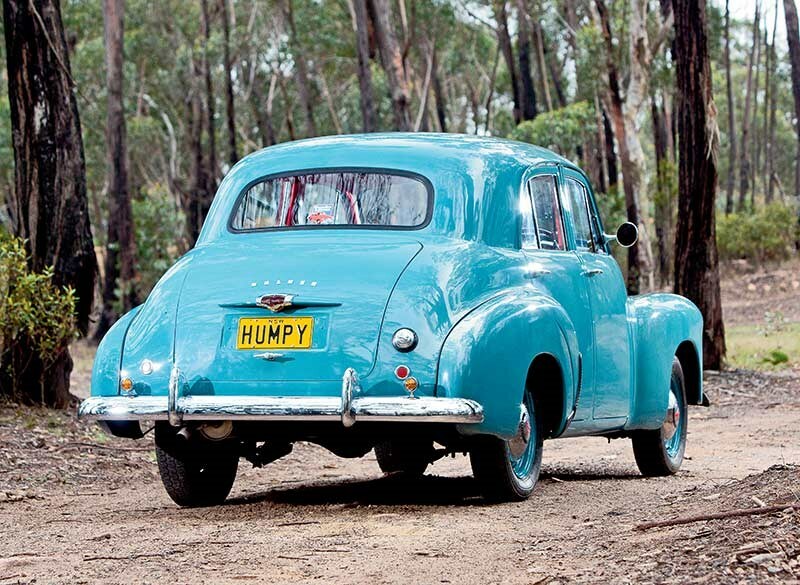 No other sedan in the 1949 world could top 80 miles per hour, average 30 miles per gallon, carry five adults and their kit, and handle Australian conditions. At a time when most cars relied on an old-fashioned chassis, the Holden was a monocoque. It weighed 10 per cent less than its rivals. Chief engineer Russ Begg had pioneered all-steel monocoque technology for mass production at Opel during the 1930s. The origin of the Holden car is best understood as a puzzle comprising several large pieces, as I demonstrated in my book Special: The untold story of Australia’s Holden. Begg’s particular expertise was the all-steel body; the next step was unitary construction. Hitler wanted mass employment and an automotive industry ready to switch quickly to total war. GM subsidiary Opel was already Europe’s biggest carmaker and benefitted more than any of the indigenous German auto companies from the Nazi program. When, as one of his first decrees, Hitler removed all taxes on new cars, radical economies of scale became possible. New technology demanding immense investment was suddenly feasible. Begg’s luxurious Mercedes-challenging Opel Kapitan of 1938 was the world’s first six-cylinder monocoque sedan and the true forerunner to the Holden. By Christmas 1944, Begg was chief engineer of the Australian car program, to be run in Detroit. Weight was the enemy of both performance and economy and Begg, according to his Aussie colleague Bill Abbott, was "a fanatic for weight saving, hence detailed weight estimates all along the line". It has long been known that the 48-215 was based on Experimental Light Car 195-Y-15, built in 1938, six years before approval for the Holden project was given by the GM board in October 1944. Begg knew it was not tough enough, but also knew he could fix that. And add power. Whether 195-Y-15 was a discarded smaller Chevrolet is unclear. 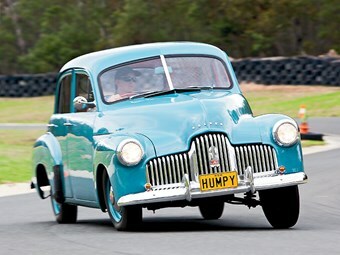 But it paved the way not only for the first Holden but also for new Vauxhalls and Opels. On 2 August 1946, engineer George Quarry noted: "Russ, Kuip and I were out in the 2½-litre Kapitan sedan which, while weighing 2676lbs curb … has very similar internal space and performance factor as our job. I felt that Australia would have accepted a somewhat reduced performance factor, especially if it had a beneficial effect on weight and cost; his reply was that such a move is quite in the other direction, as any substantially lower performance factor means a different and heavier transmission to handle the greatly increased second gear work." Defying accepted wisdom, Begg took "the other direction", namely Kapitan power (60 bhp) with 195-Y-15 weight; the world eventually followed. nothing. Old, slow and out of fashion, there was nothing to recommend the 48-215 or lookalike FJ, and little incentive to preserve them. Then, in 1975, came Young Normie and his mates from ‘The Newcastle Song’ and old Holdens were suddenly cool again. The 1980s and 90s weren’t kind, but better times were to come. 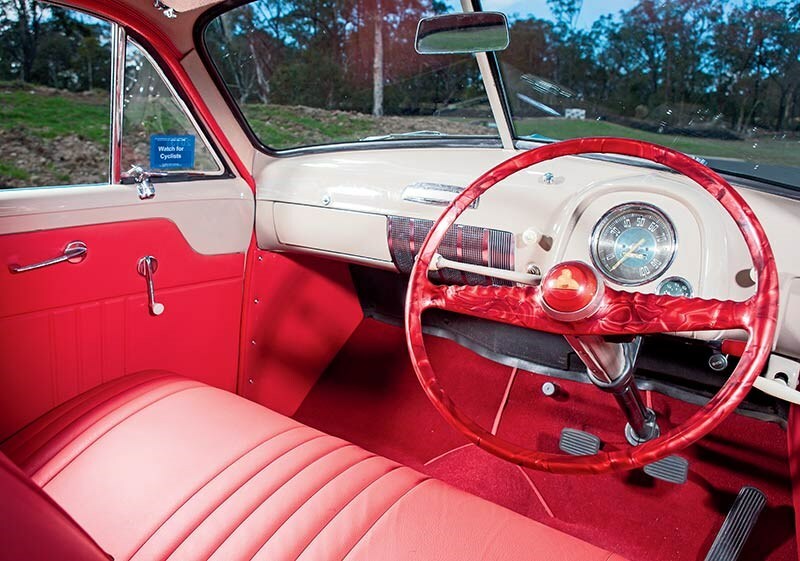 Today, whether in stock ‘grey motor’ condition or with more power and discs up front, survivors from the earliest age of Holden are climbing in value faster and more reliably than recent representatives of the doomed brand.